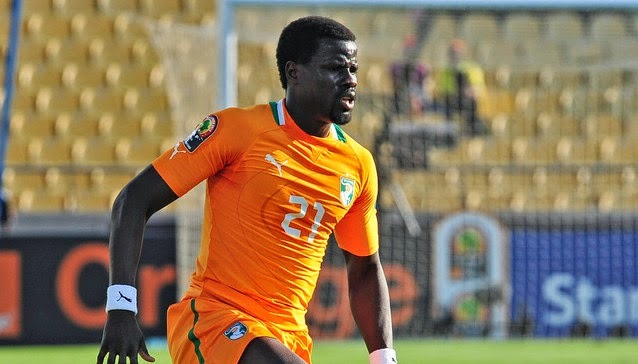 Emmanuel Eboué is a significant absentee from Côte d'Ivoire's provisional World Cup squad, released on Tuesday. The former Arsenal defender, who boasts 78 international caps, failed to make coach Sabri Lamouchi's 28-man list. The Ivorians will face Japan in their opening match of Group C on 14 June, with matches against Greece and Colombia to follow. Goalkeepers: Copa Barry (Lokeren), Gbohouo Sylvain (Sewe Sport), Sayouba Mandé (Stabaek), Badra Ali (ASEC Mimosas). Defenders: Kolo Touré (Liverpool), Bamba Souleyman (Trabzonspor), Jean Daniel Akpa Akpro (Toulouse), Arthur Boka (Stuttgart), Serge Aurier (Toulouse), Brice Dja Djédjé (Marseille), Didier Zokora (Trabzonspor), Benjamin Angoua Brou (Valenciennes), Ousman Vieira (Caykur Rizespor). Midfielders: Cheick Tioté (Newcastle), Yaya Touré (Manchester City), Romaric (Bastia), Max-Alain Gradel (St Etienne), Ismaël Diomandé (St Etienne), Didier Ya Konan (Hannover 96), Constant Djakpa (Eintracht Frankfurt), Geoffroy Serey Dié (Basel). Strikers: Wilfried Bony (Swansea), Didier Drogba (Galatasaray), Gervinho (Roma), Giovanni Sio (Basel), Seydou Doumbia (CSKA Moscow), Lacina Traoré (Monaco), Salomon Kalou (Lille).